I like to do this iconic PNW trail in the spring and camp on the upper section of the trail and then dayhike to the lake when there is a little snow left. I camped 13 miles up, one mil before the lake, at the last pre-lake campsite. Anybody know the name of that creek? When I arrived at the trailhead about 1pm on Sunday, there was not a single parking space to be found. But early arrivers were streaming back so I knew a spot would open quickly and it did. This time I didn't hit snow till literally 200 yards from seeing the lake through the trees. Some of the campsites were melted out. The lower section of trail, before the main junction, is maintained with most logs removed. Still a fair number of that from there on, though most are easy to pass over or around. I believe the creek you're talking about is Simmon's Creek? Thanks a bunch for the report. My girlfriend and I plan on taking the Herman Creek Trail to Wahtum Lake this weekend and were worried about the snow levels. Your pictures are super helpful. I'm still a little worried about the upper section of that trail, so we may end up taking Eagle Creek of the PCT to Wahtum. Looks fun! I think the upper sections of Herman Creek below Wahtum Lake are much worse. The Eagle Creek trail is on a slope that faces southwest. The Herman Creek trail is on a slope facing north. Eagle Creek goes straight up to lake. Herman goes up, then level for a while, then actually down to the lake. Simmons Creek! Thanks, my map is too low res to have a name there. I agree with Jerry on this. The Herman Ck trail goes over a ridge 800 feet higher than Wahtum Lake. Based on my hike, I would expect to hit snow above Mud Lake, almost certainly by the Anthill Trail jcn, going to the top of the ridge, which is hard to navigate under snow. I guess you could just head due south and hit the PCT eventually, but if you hit snow lower down (like near Mud Lake) then it would be very unpleasant getting to the ridge top. Maybe somebody will respond with current conditions. Otoh, you said this coming weekend. Eagle Creek can be crazy on weekends, but the weather is not looking so great next weekend. Btw, I forgot to mention that I ran into somebody who had done Eagle-Tanner CCW, so they had already come down from Tanner and were descending Eagle Ck. She said there was some snow up there but did not mention it till I asked so I interpret that as not too much. I heard from someone who visited Wahtum & surrounding trails this past weekend that there was a ton of snow on the trails - was there only snow on the trail just off the lake? jacedeloney wrote: I believe the creek you're talking about is Simmon's Creek? Thanks a bunch for the report. My girlfriend and I plan on taking the Herman Creek Trail to Wahtum Lake this weekend and were worried about the snow levels. Your pictures are super helpful. I'm still a little worried about the upper section of that trail, so we may end up taking Eagle Creek of the PCT to Wahtum. Looks fun! 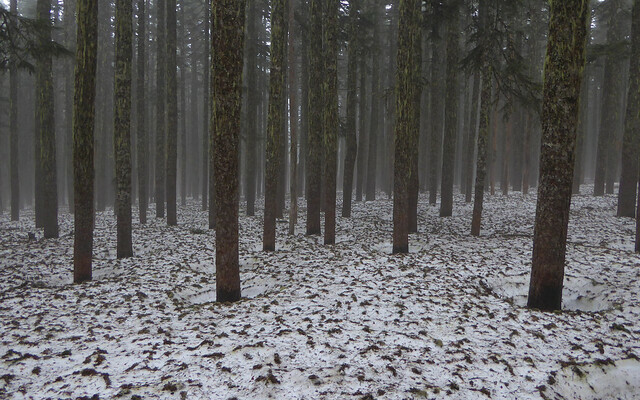 On 6/3, We went up Tomlike direct from Cedar Swamp, and hit snow as we came back down to the Herman Creek trail again. Can't say where it starts, but it was 2' deep there, and got deeper. From the PCT/Chinidere junction on down, it was gone or just a bit patchy (on Benson). mtnchicktif wrote: I heard from someone who visited Wahtum & surrounding trails this past weekend that there was a ton of snow on the trails - was there only snow on the trail just off the lake? I started up the PCT towards Indian Springs just a bit and the trail cleared within a few hundred yards of the lake, and that is north facing, but I didn't go up any farther or on any other trail. Otoh, Karl's report above shows just how much snow there is on the ridge north of Wahtum Lake. I would think that the area around Chinidere probably won't be snowfree for a couple weeks since we are going into some cool weather.